Fiona, completely out of character, has unleashed a torrent of verbal abuse on her secretary and has walked out of the office crying. Simon’s performance as an up and coming associate has dipped unexpectedly due to a diagnosis of mild/moderate depression. Anna has been diagnosed with Irritable Bowel Syndrome and has told her manager she’s convinced it’s linked to stress at work. These are the opening lines and as we all know, often things can take a turn for the worse. 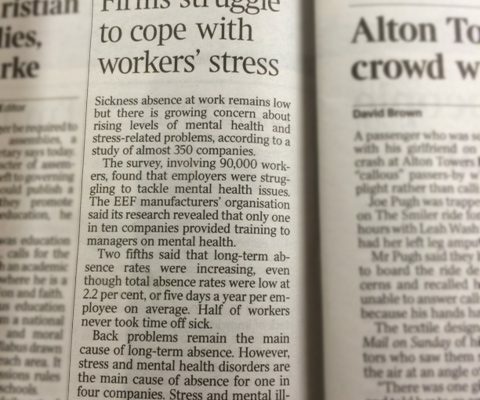 Whilst many companies are encouraging employees to contact employee help lines that provide CBT (Cognitive Behavioural Therapy) for 6 sessions the results are mixed. Let’s be honest, have we investigated what exactly is being offered, do we understand what CBT is and for whom it does and doesn’t work? Are we hoping for a magic bullet – one type of support for all? Managers and HR need to skilfully listen and recognise the early warning signs that would allow them to “nip it in the bud” and signpost them correctly. 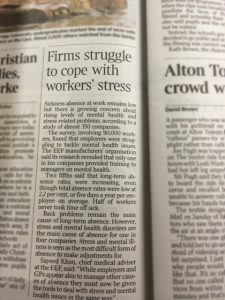 Crucially companies need to encourage employees to develop and recognise helpful techniques and useful strategies that they can employ when unavoidable life events or stressful work situations arise. Feedback from employees informs us that many are already discreetly juggling and struggling situations that they hide from their seniors, so as not to look vulnerable. The alternative is if HR and managers don’t recognise what is happening and don’t employ a variety of support, those dreaded situations escalate and can land in the lawyer’s hands with disciplinary hearings, long term disability issues and managing disability discrimination claims. So how do some of these techniques work? Over a 6 week period, employees and line managers are encouraged to go off site for one hour once a week to confidential groups. (They may choose to attend different groups). Here they meet with others, facilitated by two professional Occupational Therapists, and engage in carefully tailored and structured sessions to address the needs of the members and the problems they face. Here they learn to understand what helps and hinders their situation, what is in their control to change and crucially develop and practise their own strategies. The group effect is powerful and speeds up the process of change in a supportive environment. Developing an ability to stay focused, productive, and resourceful is a necessary skill in a fast paced changing corporate world. Sometimes, “life happens” the unpredictable, a bereavement, a health scare and despite our best efforts we learn we are fallible. Learning how to cope and coming to realise that you do have the skills to manage these difficult situations can be achieved with the right professional support and help. For HR managers recognising the symptoms early on can make the difference between keeping and supporting great staff or continually facing those dreaded situations.